Amen. I just got one of those myself. I am specially talented, and managed to cut my foot the other day. Good thing it wasn´t one one of the super carving knives, otherwise I´d be in trouble now. Did you get one of the Global knives with the “triangular” shaped handles? They take a little getting used to but are super afterwards. hahaha. 😀 did you draw that? Cartoonist, photographer, writer and cook! A quadruple threat. Step aside, everyone!! Chubby Hubby is taking no prisoners. Congrats on the mention and photo in the Guardian UK!! Great comic. 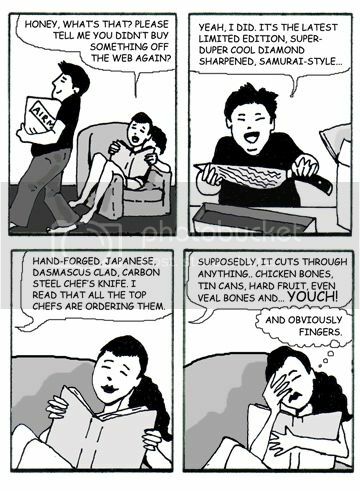 Every time I see a super fancy knife commercial on QVC, I have the same thought! Especially when they show the knives cutting through metal pipes and whatnot. Kate: You poor thing. That must have hurt. Rosa: Or learn how to heal fast? heh heh… I think as long as you cook a lot you’re bound to end up with little nicks all over your fingers. Ximena: Wow. I can’t even imagine what you were doing with your foot. Holding a piece of meat on a chopping board? Lpc: 🙂 I have a ton of knives. And have nicked myself with most of them. S just says I’m clumsy. Eddie: Thanks. I read the story on-line but didn’t know they used a photo. I must clear my name: I dropped the knife. Legendary clumsiness would prevent anything more acrobatic than that. Love the strip, by the way, I hand´t realized you´d done it, it´s really great. LOL. That’s a great cartoon! The truth is often funny isn’t it? I’ve nicked my fingers several times with my Global knives.